Michael is a PhD student at the University of Washington in Seattle. 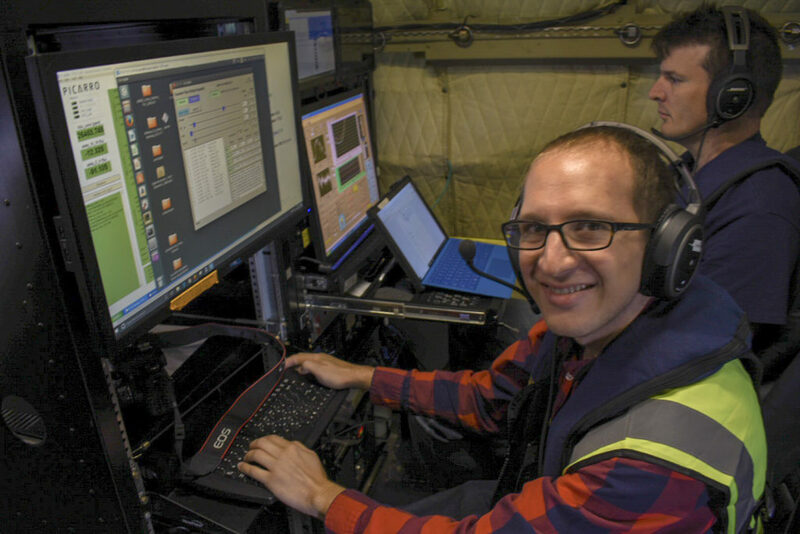 Our October 2018 deployment may be our last of the ORACLES (ObseRvations of Aerosols above CLouds and their intEractionS) campaign, but it certainly won’t be our least. (We love each of our three deployments equally, of course.) 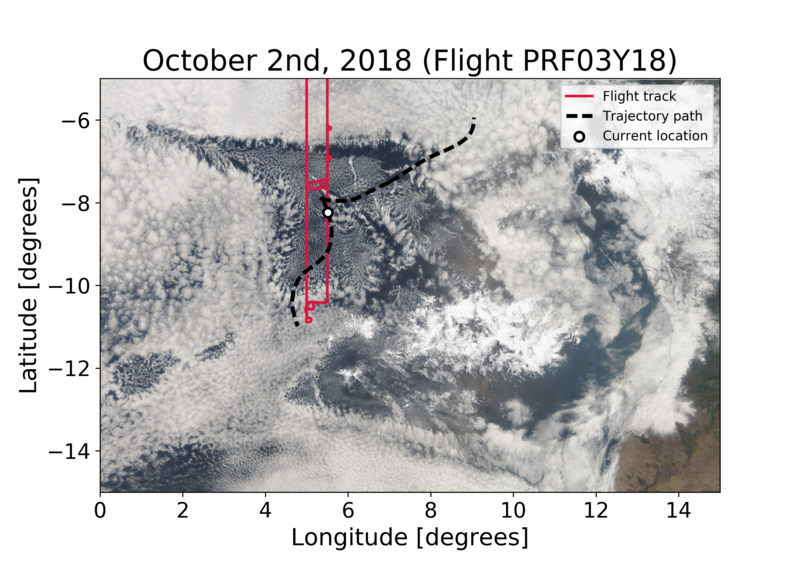 During ORACLES, scientists from multiple NASA centers, universities, and other partners came together to study the complex interactions between smoke from fires on the African continent and low-lying clouds, called stratocumulus, over the Atlantic Ocean between September 2016 and October 2018. As my colleague Andrew wrote previously, climate models struggle to accurately capture the physical processes that occur when smoke particles, also known as aerosols, overlie and mix into clouds, in part because these processes occur at such small scales. The effects of aerosol-cloud interactions can include warming from sunlight being absorbed by the smoke and/or cooling from changes in the clouds’ brightness, coverage, and precipitation — it is still uncertain whether the heating or cooling effects cancel each other out or if one effect wins out in the end. We need the best observations we can get to better understand the fundamental physics and chemistry of this smoke-cloud system and use that knowledge to improve the models. Because the clouds and smoke we’re interested in are many miles away from land, the best way to study them is from the air. 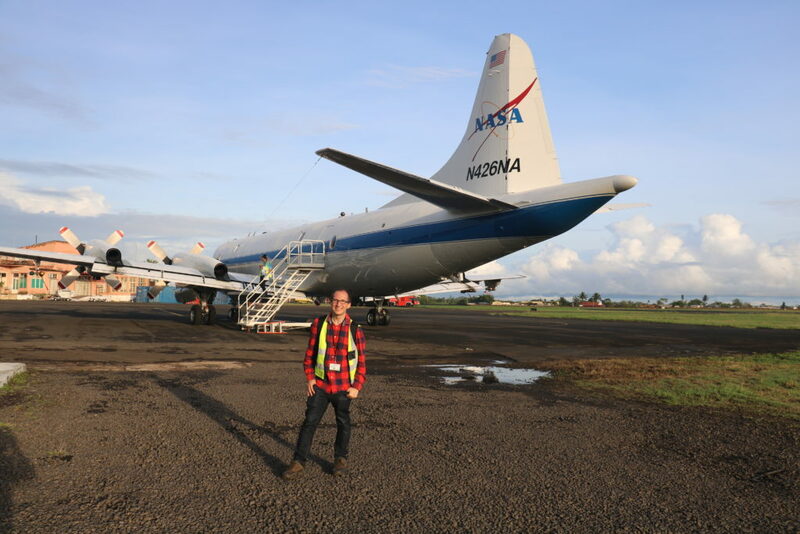 Enter the NASA P-3 Orion: a four-engine turboprop plane that can directly sample the smoke plume and the clouds, from 20,000 feet in the air all the way down to just above the ocean surface. Initial results from our September 2016 deployment showed that, because it takes a fairly long time for the smoke from above to mix down into the cloudy layer, it may be best to study the smoke-cloud interactions by following individual cloud systems. This means we can account for how a cloud changes and evolves over time and how long the clouds and smoke have been in contact. 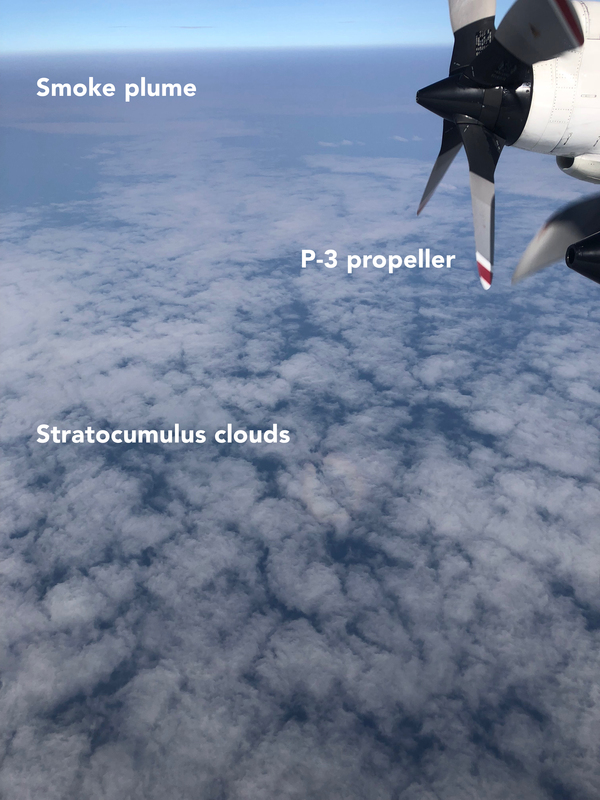 For two of our ORACLES-2018 flights, we attempted to do just this, using a forecast model from the National Oceanographic and Atmospheric Administration (NOAA) to predict where clouds sampled on one flight would end up the next day, and then sampling the clouds there. For a fairly typical wind speed of around 10 knots, the clouds can travel approximately 300 miles in one day. A great opportunity for this type of flight arose on October 2nd. The day before, a “pocket of open cells,” or POC, developed around the area we normally fly. In a POC, the stratocumulus clouds arrange themselves in a quasi-hexagonal pattern, with cloudy areas on the edges and clear skies in between. 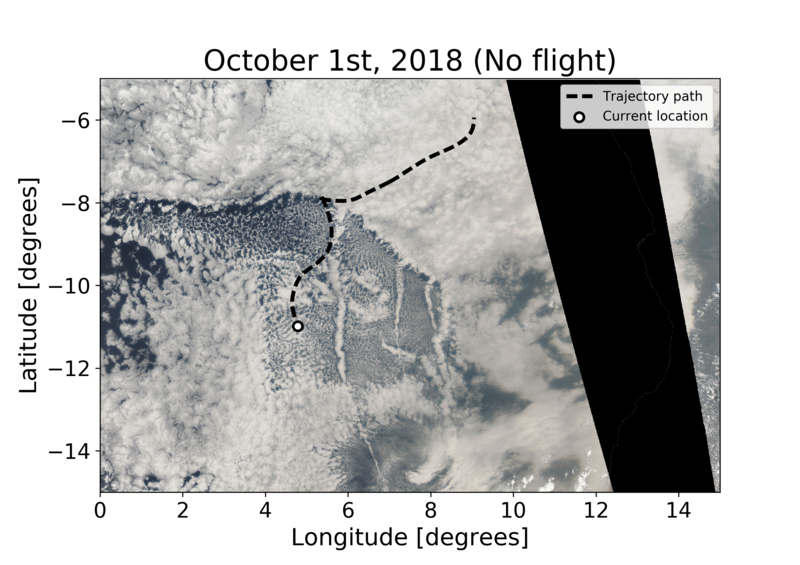 In “closed cell” clouds, which we sampled more regularly, the opposite pattern holds, with clear slots at the sides and overcast skies in between. During most ORACLES flights, we aimed to sample “polluted” clouds, with lots of aerosols in the air below the cloud. POCs are an interesting case because they tend to be very “clean,” removing aerosols from the air through drizzle. This precipitation is very likely the driving factor determining whether the clouds arrange themselves in open or closed cellular formations. We still have open questions remaining about whether aerosols can suppress precipitation and induce the open cells to transition into closed cells. We first sampled the POC on October 2nd, flying above, below, and within the clouds. 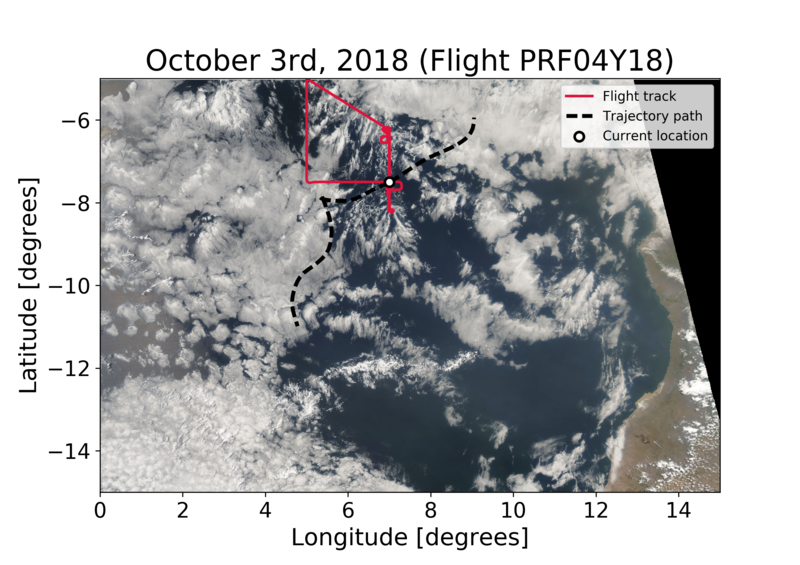 We were also able to sample another interesting feature: the white diagonal line of cloud that can be seen cutting through the POC near where we flew is called a ship track. Ship tracks are formed where the exhaust from ships emits particles and gases that form new aerosols, which can then interact with the clouds. (There are some other ship tracks visible in the satellite imagery from October 1st and October 2nd as well.) As expected, most clouds we sampled were drizzling and the below-cloud air was very clean. The more overcast linear feature in the ship track will help us better understand how clouds transition between open and closed cells. On October 3rd, we set out on a mission to resample the POC and see how the clouds had changed and whether any smoke had been mixed into the below-cloud layer. We were heartened to see from our satellite imagery that the POC had traveled to roughly the same area we had forecasted. The POC by this time was dissipating: some well-developed open cells are still visible, but the POC boundaries had eroded and more “actinoform,” or lace-like, clouds had formed. True color satellite image of the dissipating POC on October 3rd from MODIS. The dotted black line shows the trajectory from before. The white circle is now at the location the original air was forecasted to have traveled to two days later. The POC can be seen as the collection of open cells and actinoform clouds between 6 and 9 degrees south and 3 and 9 degrees east. More analysis will need to be done after we’ve had a chance to calibrate and quality control the data, but our initial readings suggested the below-cloud layer was still relatively clean, with some mixing of smoke from above evident. At the end of this October 2018 deployment, data collection for the ORACLES campaign will be complete, but there will be plenty of science left to do. Not only do we have our own data to analyze, but there have been other American, British, French, German, and Namibian and South African teams studying similar questions in the same region that we will collaborate with. Together, the multiple field campaigns and model intercomparison projects just completed and currently in the works will greatly improve our understanding of smoke-cloud interactions over the southeast Atlantic and their implications for the regional and even global climate system.